An evenly tensioned warp is way more important than a tightly beamed warp. Most people don't have the luxury of having a helper to hang on to the warp threads while winding them onto the warp beam of their loom. 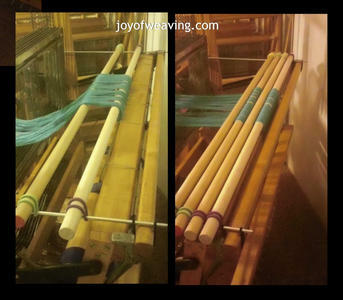 When warping by yourself, getting an evenly tensioned warp by yourself can be a challenge, but there are techniques you can use to get the job done. The Simple Tension Device has got to be one of the weaving world's best kep secret as you won't hear very much about it. The best method, of everything I have ever tried (and I tried them all), is to use a tension device. Harrisville Designs makes a "Tension Device" and Purrington Looms makes a thing called "Angle Wings". I took both of their ideas and incorporated them into one easy DIY with inexpensive stuff at the hardware store and what I already had in my weaving arsenal of tools. Every other dowel is placed onto the cross sticks then the warp is laid on top of those dowels. 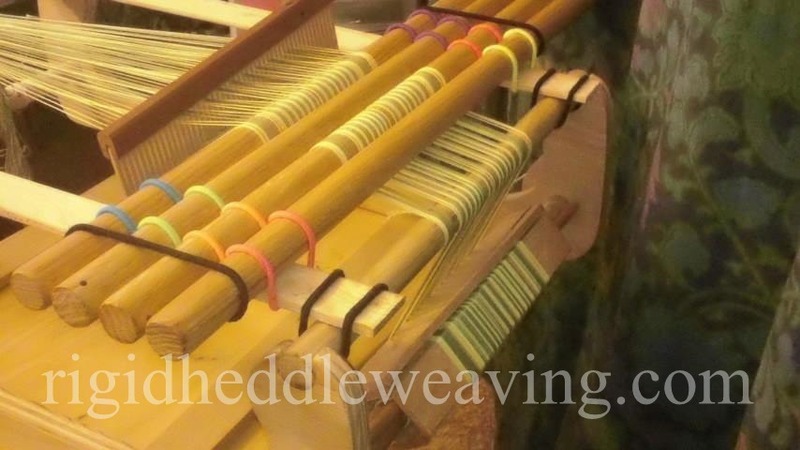 Then, every other dowel is placed on top of the warp threads. The "over and under" of the warp threads between the dowels causes drag on the threads, producing an evenly tensioned and tighly beamed warp every time! The dowels create drag. The more dowels, the more drag. The more drag, the more tension. Here's a picture of one on my frame loom. You can tie any heavy object such as a claw hammer to the ends of the warps (or plastic milk jugs that have handles, filled with water or rice). You let the warps, with the weights attached, drag on the floor as you wind onto the beam. Just make sure that if you use multiple weights, that they're all exactly the same or you will end up with an uneven tension. Crank and Yank is exactly as implied: turn the warp beam and give a tug on the warp threads. This works extremely well. If you do this on a floor or table loom, bring the warp under the breast beam, up and over the castle towards the back of the loom. What are the colored bands you have used to anchor the dowels in place? Could they be ponytail hair bands? I used hair bands, yes. You can use anything that will keep the dowels from spinning: string, rope, rubber bands, elastic, tape, whatever you have on hand.